Starry Christmas Night – Where Is My Teaspoon? You guys! Christmas is nearly here! I am someone who absolutely loves Christmas and have been counting the days down for a few weeks now. However, I know not everyone feels the same way – apparently – so I’ve held out until now to start sharing Christmas ideas. 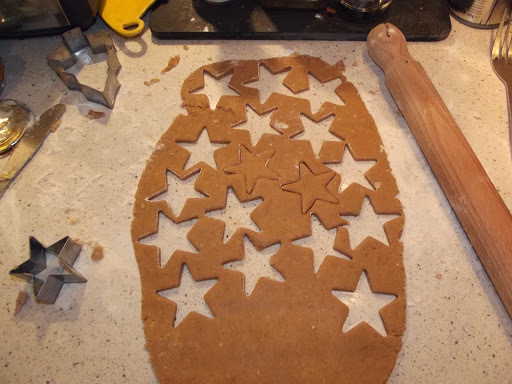 Tonight I’m going to share a simple gingerbread biscuit recipe. To be honest, a lot of these recipes are the same so you can just adapt them all to suit you. I usually look to Mary Berry for a guide and then change it up to suit my taste. 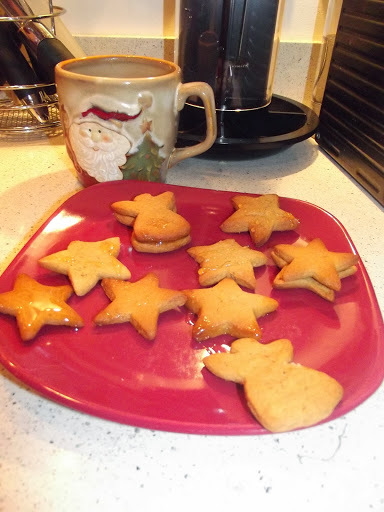 I’ve used different cookie cutters to make the biscuits seem cute and festive and have also made a quick caramel to drizzle over them. This recipe is dead easy. Line up some baking trays and preheat your oven to 190 degrees. Weigh out your flour, cayenne pepper and ground ginger and mix together. Add your butter and use your fingers to rub it in until it looks like breadcrumbs. Add the vanilla extract to your egg and beat together. Measure out your golden syrup and add to your flour and butter mix. Then add your egg. Get a wooden spoon and mix all together. It’ll seem like it’s too dry but it will come together. Use your hands in order to make it into a soft dough. It will smell lovely. 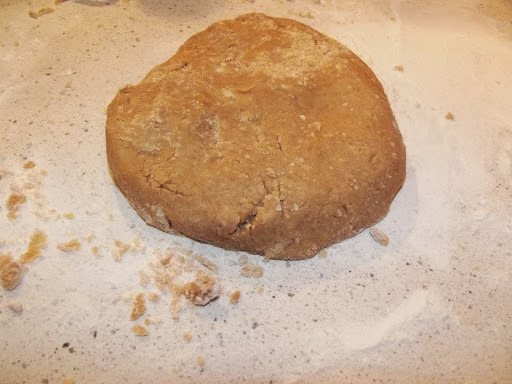 Move your dough onto a lightly floured surface and shape it a bit. Find a rolling pin and roll out the dough to the thickness you require – I like the cookies to be quite thin but you might prefer them thicker. Use your different cookie cutters. I got mine in Delia’s Kitchen in Cork, they were about 80c each. I think the smaller ones look dead sweet but you eat way more of them because they seem so tiny. Place them on your baking trays – don’t worry about leaving too much room between them, they won’t spread out too much at all. They take about 12-15 minutes to bake. You want them to be a good, brown colour. When you think they’re baked, take them out and place them on a wire tray to cool. 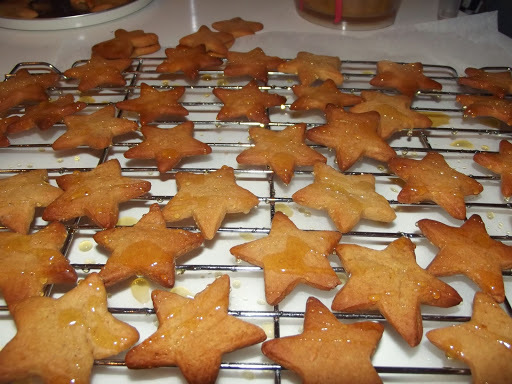 At this stage, you can dust them with icing sugar (to look like snow) and leave them, or you could make a quick royal icing with icing sugar and water and dip the star edges in it. Or, you can make the caramel. 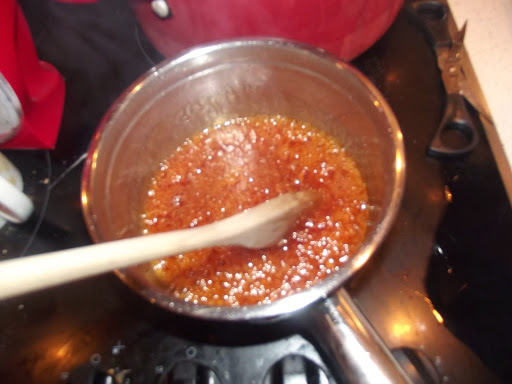 Put the water, syrup and sugar into a saucepan and heat, stirring all the time. You’ll see all the sugar and salt will dissolve and it’ll bubble up. Keep stirring until it thickens and then take it off the heat and put it into a jug. Don’t leave it in your saucepan though because the heat of it will still cook it and it could burn (My first one did! Nightmare to clean off). Put your caramel into the fridge while you let the biscuits cool. When you’re ready, drizzle the caramel over your biscuits. Or you could use the caramel to sandwich the cookies together. Delicious. Previous Post Eclairs. I don’t care. Next Post But, like. Is there really meat in them?